Alpacas are one of the smallest members of the camelid family. Like their cousin, the llama, they have been bred in South America for thousands of years. 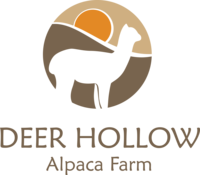 The alpaca produces a beautiful, long stapled very luxurious fiber that is used in the finest garments. Alpacas are intelligent, clean, quiet, and easily managed on small acreage. They are the result of 6000 years of breeding by the Incas of South America to provide a fiber that is lustrous, strong and wonderfully soft to the hand. Alpacas are very hardy, having been raised in the high Andes Mountains for centuries. They are pasture efficient and do not challenge fences. Gestation is 11 months with a single cria (baby alpaca) being born. They are sheared once a year in the spring. 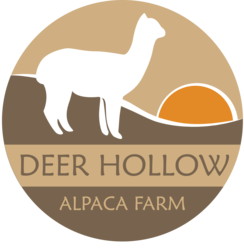 Alpacas are quiet and gentle and are one of the few animals which can be profitably raised on small acreage. This makes the little alpaca a fine opportunity for established farms to diversify or for small farms to specialize. Alpacas come in a wide range of colors from purest white to jet black with a full spectrum of browns in between. They also produce a wide range of grays from light to dark silver and rose grays. In addition to a wide variety of colors, alpacas also have many patterns that include white and dark colors. There are two kinds of fiber types among alpacas: the fluffy huacaya, and the elegant suri with long, lustrous fiber.